OXFORD, Miss. 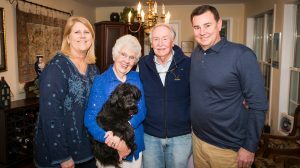 – At her front door, Sandy Grisham embraces Bill and Lee Anne Fry. It’s her standard greeting whenever the Frys visit her and her husband, Vaughn. At the University of Mississippi in the late 1970s, Bill Fry took several classes under Vaughn Grisham, professor emeritus of sociology. Their relationship has long since moved past that of professor and student to something deeper and more familial. “Can I pour you some coffee or tea?” Sandy Grisham offers the couple. They’ve just arrived at the Grishams’ Oxford home from New York City, where Bill Fry is a managing director of American Securities, a leading U.S. private equity firm. He asks for water as he walks through the kitchen to give Vaughn Grisham a hug; a time of catching up will inevitably follow. Admiration for the Grishams recently led the Frys to make a major gift in support of the McLean Institute for Public Service and Community Engagement, housed on the university’s Oxford campus. Sandy Grisham, a former Ole Miss graduate instructor of American government and sociology and retired instructor of political science at Northwest Community College in Oxford, echoed her husband’s sentiments. Developed by Vaughn Grisham in honor of Tupelo newspaper publisher George McLean – whose mission was to raise the quality of life for all Mississippians – the institute collaborates with students, faculty and staff around volunteerism, service-learning, community-based research, community development and social entrepreneurship. It then works to apply its collective knowledge to solve problems related to poverty in communities across the state. Under Grisham’s direction, the institute became a national leader in community development. “I know about the work that Vaughn and Sandy have done and what a difference it’s made for the people who live in those communities,” said Bill Fry, a Memphis native. “I hope this gift will help expand their work to more communities and have an even bigger impact. The Frys’ gift is already being used to help support 10 different communities’ entrepreneurial efforts and to teach the residents how to start and maintain businesses. Bill Fry is a 1980 graduate of the UM public administration program. He also earned a master’s degree from Harvard Business School in 1990. Between undergraduate and graduate schools, he spent eight years in the U.S. Navy, last serving as a lieutenant in the Nuclear Propulsion Program. He also remembers being active in Phi Kappa Psi fraternity and Navy ROTC, driving cars in the Grove before football games and tutoring student-athletes – a job Vaughn Grisham helped him get. Fry joined American Securities in 2010. Previously, he was CEO of Oreck Corp. and also helmed several entities owned by various private equity firms and public companies, holding positions as president of the Dixie Group, CEO of Bell Sports and Bell Riddell, and president of Easton Bell Sports. For almost 15 years, he has served on the UM School of Business Administration advisory board, which recently established a venture capital fund to provide financial support and mentorship to student entrepreneurs. “In our state, there are things that we can and must do,” Fry said. “We can make our communities great, we can grow our entrepreneurs and we can make our children better educated. The Frys met in Washington, D.C., and have two grown children. In 2012, the Grishams watched with Lee Anne Fry as her husband was inducted into the Ole Miss Alumni Association Hall of Fame. “They’re such neat people,” Sandy Grisham said. “As a couple, they’re the kind of people you want your kids to be. They have a sense of humor. They don’t take themselves too seriously. To support the efforts of the McLean Institute, make a gift by visiting http://www.umfoundation.com/makeagift or contact Denson Hollis at 662-915-5092 or dhollis@olemiss.edu.